From the inimitable New Yorker journalist Lillian Ross—“a collection of her most luminous New Yorker pieces” (Entertainment Weekly, grade: A). A staff writer for The New Yorker since 1945, Lillian Ross is one of the few journalists who worked for both the magazine’s founding editor, Harold Ross, and its current editor, David Remnick. She “made journalistic history by pioneering the kind of novelistic nonfiction that inspired later work” (The New York Times). 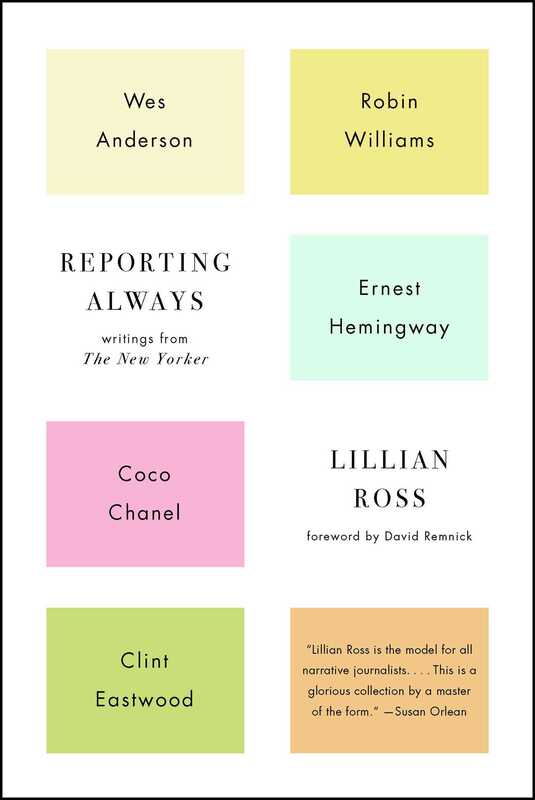 Reporting Always is a collection of Ross’s iconic New Yorker profiles and “Talk of the Town” pieces that spans forty years. “This glorious collection by a master of the form” (Susan Orlean) brings the reader into the hotel rooms of Ernest Hemingway, John Huston, and Charlie Chaplin; Robin Williams’s living room and movie set; Harry Winston’s office; the tennis court with John McEnroe; Ellen Barkin’s New York City home, the crosstown bus with upper east side school children; and into the lives of other famous, and not so famous, individuals. “Millennials would do well to study Ross and to study her closely,” says Lena Dunham. Whether reading for pleasure or to learn about the craft, Reporting Always is a joy for readers of all ages. Lillian Ross is an American journalist and author who has been a staff writer at The New Yorker since 1945. She began as a “Talk of the Town” reporter and, over the course of her career, she has written hundreds of pieces, contributing to nearly every section of the magazine. "Lillian Ross is the model for all narrative journalists. Open-eyed, sharp-witted, and fundamentally kind-hearted, she has diamond-hard reporting skills and an effortlessly graceful way with words. Each story here shows her at her best, as keen storyteller and social observer, whether she is peering into the world of Hollywood swells or bumbling school kids or wherever else her curiosity takes her. This is a glorious collection by a master of the form." Lillian Ross has elevated journalism--storytelling--to an art but it is her art, singular and brilliant.Her innate sense of form and eye for the telling, often humorous detail, are part of what makes her work so indelible and influential--that and her understanding of how the family of man becomes just that. "Lillian Ross is the mistress of selectively listening and viewing, of capturing the one moment that entirely illumines the scene, of fastening on the one quote that tells all. She is a brilliant interpreter of what she hears and observes." "Even though Reporting Always contains mostly period pieces, with special relevance for older readers, they are such remarkable examples of the art of the interview that younger readers, too, should relish them."